Are your eyelids rimmed in red, itchy, or irritated? Do you wake up with crusting along your eyelid margin? 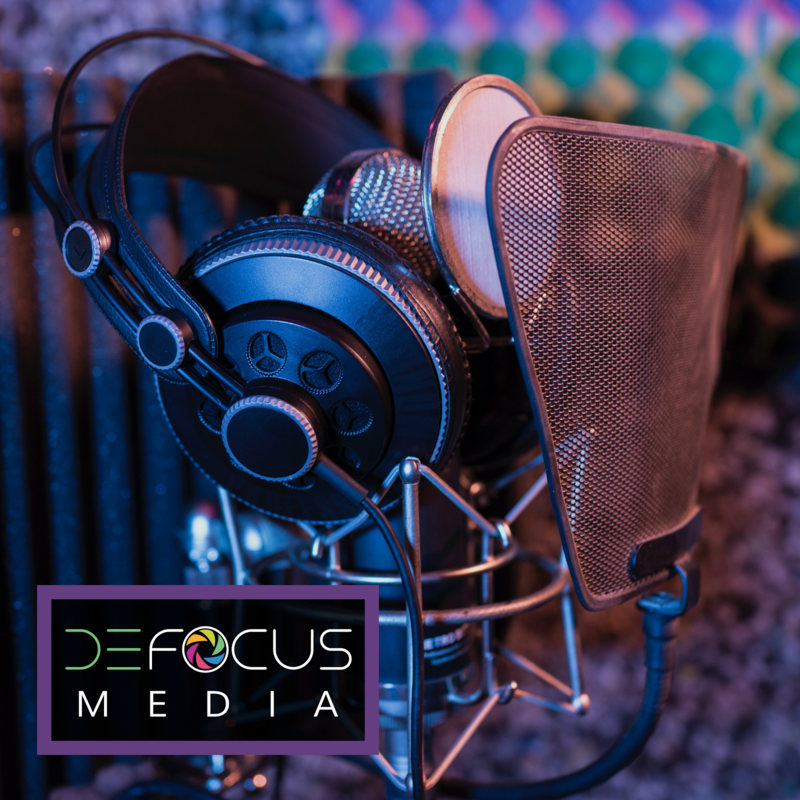 Is your vision blurry sometimes between blinks? If you answered yes to one or all of these questions, you may have a common ocular condition called blepharitis. Like most medical terminology it sounds intimidating, but the word roughly just means eyelid inflammation. Winter months are a notorious time for this type of inflammation because your skin is drier, triggering a cascade of changes that results in itchy, irritated eyelids. Debris built up on the lashes causes a lot of inflammation! Using a hot wash cloth, gently massage your top and bottom eyelids. Aim for the eyelashes for best results. Think of your eyelashes as natural debris trappers. They are there to catch dry skin and keep it from getting into your eyes. Problem is, if you don't remove the dry skin it can build up there and cause increased irritation and bacteria levels along your eyelid margin. Removing this debris (or "collarettes" as it's known in the medical community) is essential to increasing comfort and returning your eyes to normal! 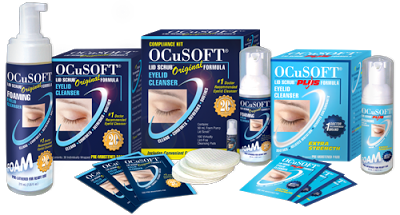 I personally love products like Ocusoft, which makes eye-safe cleansers that come in individual pads or a pump-bottle foam. Just open the pad, massage your eyelids, and then rinse. You can use them for daily debris removal, and it is gentle and safe enough to use around the eyes. These products are a nice upgrade to the old home remedy of baby shampoo that you often hear about. And you don't need an Rx--Ocusoft eyelid cleansers are over the counter, on the same aisle as rewetting drops. I like to use these daily in the AM to remove crusting that builds up overnight. For women, it is great in the evening for mascara removal too! 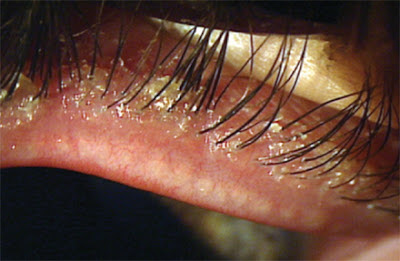 Blepharitis can cause clogging of the tear glands (meibomian glands) that line the inner eyelid margin as well. This leads to drier, more uncomfortable eyes. A rewetting drop can help refresh the eye, relieving the symptoms of dryness. The best drops for this specifically supplement the missing tear film components from clogged meibomian glands. Systane Balance and Refresh Advanced are the 2 specific drops on the market targeted for this. This eyelid has a ton of surface debris, and all of that inflammation is clogging up the meibomian (tear) glands that run just under the eyelashes. This will make you eye very dry and uncomfortable as a side effect! 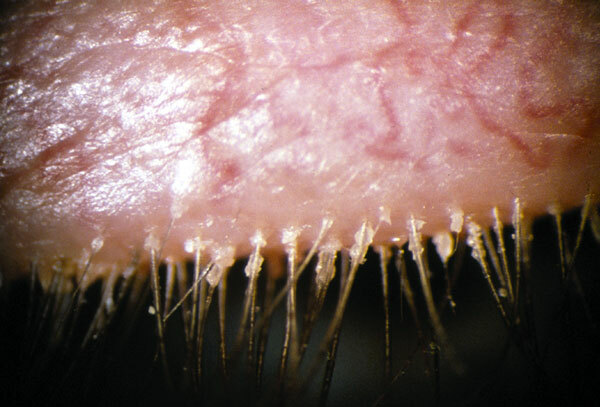 These treatments may not be enough to fully resolve severe blepharitis, and sometimes ointments or steroids are needed to combat the inflammation more completely. Remember, blepharitis is a chronic condition, so you will likely suffer from flare ups year after year. Addressing the symptoms early on with regular warm massages and eyelid cleansers can help you from getting an advanced case in the heart of winter!